Donner Lake is one of many small, picturesque lakes in the Tahoe National Forest towards the north end of the Sierra Nevada Mountains; it is popular for fishing, boating and even swimming in summer, and there is a pleasant, spacious campground along the eastern edge. 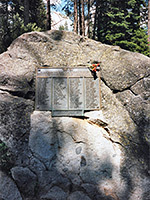 This area is part of the Donner Memorial State Park - the main reason why people visit is to see the location of one of the most famous episodes in the history of the pioneer days of the American West. It was in this seemingly benign woodland that several dozen members of the Donner Party, a group of emigrants heading west to start a new life in California, became stranded during the particularly cold, snowy winter of 1846, and eventually some had to resort to cannibalism to survive. Whole books have been written about the story of the Donner party, but the basic facts are that the group of emigrants, led by George Donner and his extended family had been travelling along the California Trail from Illinois and were badly advised to use a southerly short-cut across the Great Salt Lake Desert in Utah. This proved impassable, and the consequent delay resulted in the party being unable to cross the Sierras before the start of winter. They built rough cabins in three locations several miles apart near what is now Donner Lake and settled in for the season. Heavy snowfall meant that a rescue was impossible until the following spring; starvation followed and some of the people that died were consumed by the survivors. Doubtless the settlers would be most surprised to find a busy interstate just a few miles away from their isolated campsites, but today both I-80 and the main northerly trans-Sierra railway pass just alongside Donner Lake. 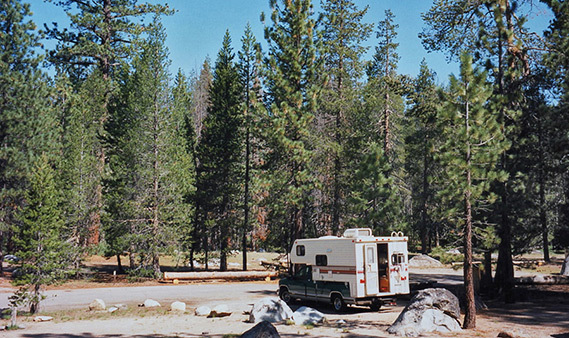 The surroundings are scenic and peaceful, and the state park is an ideal overnight stop for cross-country travellers, even for those not particularly interested in the history of this area. There are various trails through the forest and along the lakeshore, and a well-stocked, informative museum covering aspects of pioneer life, the construction of the railway, the natural history of the Sierra Nevada area, and the story of the Donner emigrants in particular. 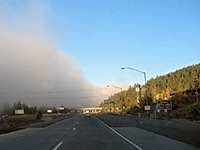 The adjacent town of Truckee has a small selection of hotels. Two sites in the woodland have a direct connection with the Donner party. One is a large boulder, which formed the fireplace and part of the back wall of the cabin belonging to George Murphy, one of the members of the group. There is however no visible sign that one of the settlements was located here apart from a commemorative plaque, erected in 1919, that bears the names of the 48 people who survived and the 42 who perished. A rather more evocative sight is a group of several aged tree stumps in a grassy meadow, close to a clear fast-flowing stream about 300 feet from the boulder. These are the remains of trees cut down to snow level in the 1846 winter and used for fuel and building construction; they now stand several meters high, a sobering indication of the massive snowfall of that year. It is remarkable that some of these tree trunks have survived to this day.